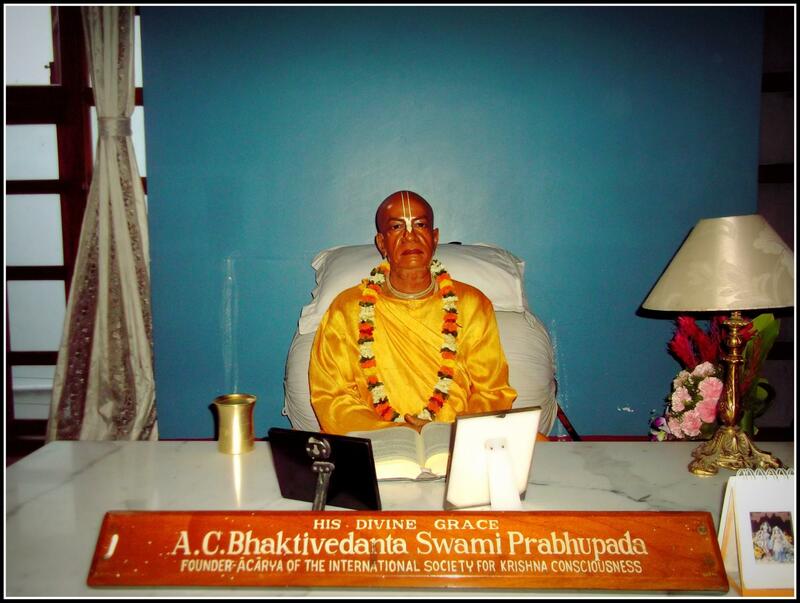 Sri A.C. Bhaktivedanta Swami Prabhupada, the founder acharya of Iskcon, our dear spiritual grandfather, has been and continues to be the greatest proponent of Krishna consciousness in the entire world. A true visionary, Srila Prabhupada, has built a home in which the whole world can live in peacefully. The International society for Krishna consciousness (his brainchild) has expanded its footprints to all corners of this world today, and has been instrumental in distributing the causeless mercy of Lord Caitanya in every town and village. Srila Prabhupada is none other than the commander in chief of Lord Caitanya, and he was empowered by the Lord and His Gurudeva to deliver the fallen souls all over the world. From the time he landed in America (1965) till the time he left his body (1977), Srila Prabhupada had encircled the globe a full 12 times, overseeing the construction of over a hundred Iskcon temples.In addition he has left us with hundreds of his books that continue to provide guidance and inspiration to devotees all around the world.‘The Gaudiya Treasures of Bengal’ has covered the life and pastimes of Srila Prabhupada in more detail in the article entitled – ‘The birthplace of A.C Bhaktivedanta Swami Prabhupada, Tollygunge’. In this present article ,however, we intend to provide a brief sketch of his pastime places in central Kolkata ,where he had grown up and spent a significant portion of his life. This is where Srila Prabhupada grew up as a child. Sri Gour Mohan De, Prabhupada’s father, had rented out a few rooms of this building and resided here along with his family.The entire building was owned by the Mullicks (refer – ‘The pious Mullicks of Bengal’). This building ,referred today as ‘Govinda Bhavan’, is presently occupied by the Gita press. In all probability the Mullicks had rented out this building to the Gita press, once the De’s moved out and shifted to Allahabad in mid 1920s. Srila Prabhupada used to often talk about his childhood days that he had spent over here at Govinda Bhavan; how he used to celebrate the Rathayatra festival here pulling his small deity carts; how he used to be amazed looking at the tram cars that used to be then drawn by horses (not electricity). When we visited this place we could as if feel Prabhupada and his childhood pastimes were being enacted before our eyes. How to Reach : One needs to board a metro and get down at the MG Road metro station. Reaching here, one needs to seek the address of the Gita Press.Govinda Bhavan is hardly a five minutes walk from the MG Road metro station. Just opposite to Govinda Bhavan, lies the ancient temple of Radha Govinda jiu. Srila Prabhupada used to visit this temple daily and pray to the Lordships. In one of his later conversations, Prabhupada identified Radha Govinda jiu as the inspiration of his devotional life. The mesmerizing deity of Sri Radha Govinda jiu with their slanting eyes continues to enchant one and all with their blissful darsana. This beautiful temple and its deities were established around 200 years ago by Late Srimati Chitra dasi (wife of Sri Rama Locana Mullik) on the 12th of February, 1822 AD. In addition to Radha Govinda jiu, the temple also houses the enchanting deities of Gaura-Gadadhara and Sri Balarama Revati devi. The present priest Sri Durga Pada Chattopadhyay has been serving this temple for the last 35 years. How to Reach : One needs to board a metro and get down at the MG Road metro station. Reaching here, one needs to seek the address of the Gita Press.Radha Govinda temple , situated opposite to the Gita Press,is hardly a five minutes walk from the MG Road metro station. Mutty Lall Seal was an indian businessman and philanthropist, who inspite of his humble beginnings, amassed a huge fortune surpassing all of his contemporaries. He was well known for his charitable nature. In the year 1842 , he established this Mutty Lall Seal Free college (later renamed to Mutty Lall Seal school) that enabled the young men and women of those days, to get educated in english and occupy posts of trust and emolument in their own country.The college stood in high estimation of the public and competed successfully with the other Government and Missionary Colleges in the University examinations. Srila Prabhupada and Suniti Kumar Chatterji were some illustrious students to have passed out of this college. 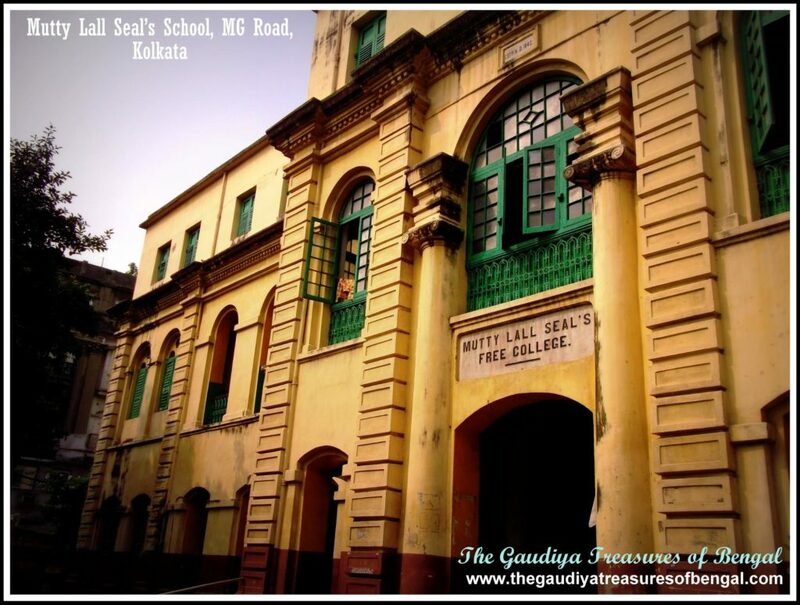 Sri Mutty Lall Seal is also the gentleman who had donated a huge tract of land, on which stands today the Calcutta Medical college.The Mutty Lall Seal school is a stone’s throw from Govinda Bhavan. How to Reach : One needs to board a metro and get down at the MG Road metro station. Reaching here, one needs to seek the address of the Mutty Lall Seal’s school. It is quite easily visible from the main road itself and hence shouldn’t be too difficult to locate. 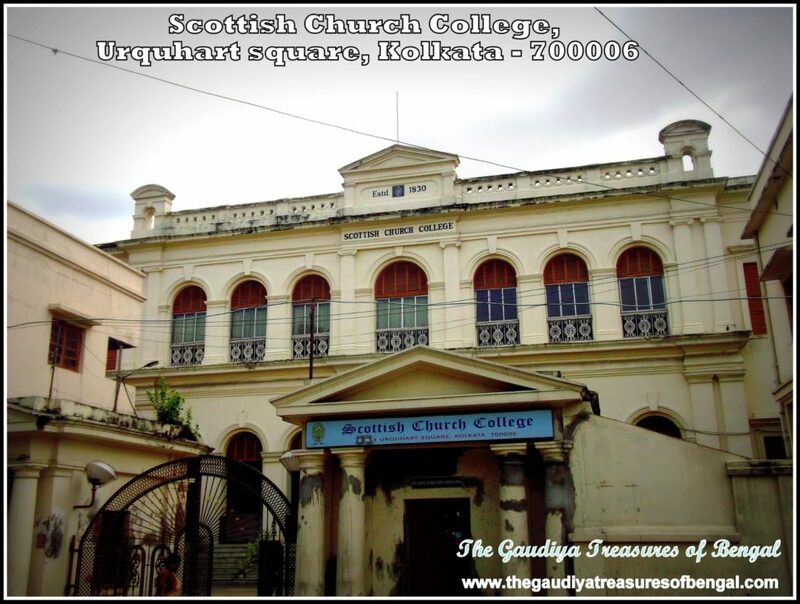 During those days, there were primarily two prestigious colleges in the city of Calcutta – Presidency college (situated at college street) and the Scottish Church.Srila Prabhupada chose to enroll here at Scottish church where he studied sanskrit and english in his first year ,sanskrit and philosophy in his second year and philosophy and economics in his third.This college was established in the year 1830 by Rev. Alexander Duff who was the first missionary to India from the church of scotland.The College is the second oldest in North Calcutta and has produced numerous outstanding people, chief among them being A.C Bhaktivedanta Swami Prabhupada, Swami Vivekananda and Netaji Subhas Chandra Bose (a contemporary of Srila Prabhupada). The College is presently owned and administered by the Church of North India through the diocese of Calcutta. How to Reach : We are providing below the official address of the scottish church college : 3, Urquhart square, Kolkata – 700006 . This place is located near the Hedua Park. One needs to get down at the Girish Park Metro station and avail an auto rickshaw from the Beadon street crossing, to reach Hedua. Reaching Hedua, one can seek directions to this college. Another very significant address in this context, is ‘1 Ultadanga Main Road’, where Srila Prabhupada first met with his eternal spiritual master, Srila Bhaktisiddhanta Saraswati Thakura (in the year 1922). Accompanied by his friend, Narendranath Mallik and solely upon his insistence, a reluctant Abhaya Carana (as Prabhupada was then called), went to meet Srila Bhaktisiddhanta. He was very much a follower of Mahatma Gandhi back then, and was not too fond of associating with the sadhus. In their very first meeting, Srila Saraswati Thakura, seeing that Abhaya was well versed in English, urged him, to preach Lord Caitanya’s message in the western countries. Srila Prabhupada was very impressed. 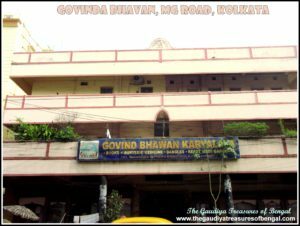 So it was here at Gauri Bari Lane (1 Ultadanga Main Road), that Srila Prabhupada had received the blessings and the first instructions of his spiritual master. This property ,which Srila Bhaktisiddhanta had then rented, served as the headquarters of the Gaudiya Math in Kolkata before it shifted to Baghbazar in the year 1930. He used to call it the ‘Bhaktivinoda Asana’.This ancient property is presently owned by Iskcon Kolkata and it is in the process of getting renovated. How to Reach: One can board a metro and get down at the Sovabazar Metro station. From Sovabazar one needs to hire an auto rickshaw in order to reach the Gauri Bari Lane. 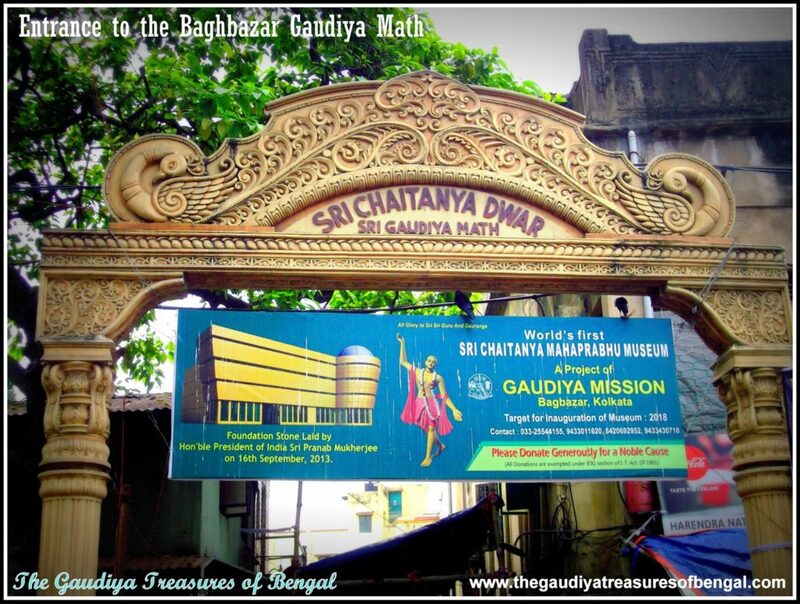 Presently under the authority of the Gaudiya mission, the Baghbazar Gaudiya Math was established by Srila Bhaktisiddhanta Saraswati Thakura (spiritual master of Srila Prabhupada) on the 5th of october,1930. Sri Jagabandhu Dutta belonging to the Banaripara of District of Barisal (Bangladesh) procured a piece of land on the bank of the Ganges at Baghbazar and donated it to Srila Bhaktisiddhanta for the purpose of establishing this temple. Calcutta was then the capital of British India. Srila Bhaktisiddhanta Saraswati, after having established the Caitanya Math at Mayapur (refer – ‘Sri Caitanya Math , Sri Chandrasekhar Acharya Bhavan (Masir Bari), Mayapur, Navadvipa’) wanted to open a main center ,his head office, in this capital city. This beautiful temple, ornamented with marble halls, is situated at a place where Mahaprabhu had once rested for sometime while travelling from Jagannatha Puri to Baranagar (refer – ‘Sri Bhagavatacharya’s residence,Baranagar Path bari’). 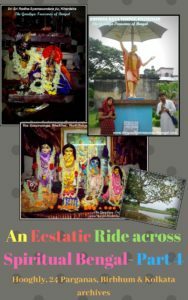 ‘The Gaudiya Treasures of Bengal’ has dedicated a separate article to the Baghbazar Gaudiya Math (‘Sri Gaudiya Math, Baghbazar, Kolkata’) to cover its pastimes in more detail.Srila Bhaktisiddhanta Saraswati Thakura had spent the last six years of his manifested pastimes here at Baghbazar. 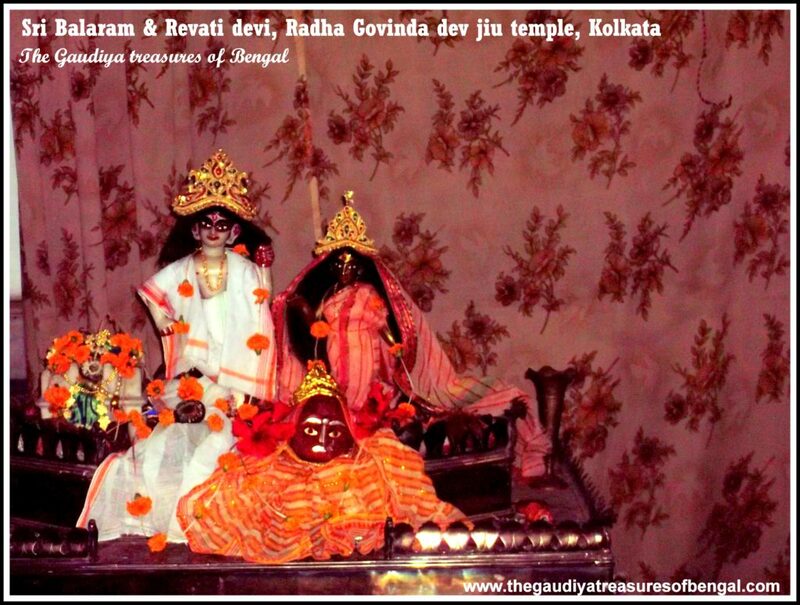 The enchanting deities of Sri Gaura Radha Binodananda jiu continue to provide their mesmerizing darsana.The room where Srila Bhaktisiddhanta used to once live and his bhajana Kutira have been carefully preserved here at the Gaudiya Math till this day. After establishing temples all over the world, Srila Prabhupada returned to kolkata (his birthplace). Here at the 3C albert road, he established the first ISKCON temple in India. The temple had very humble beginnings, initially occupying only a single floor of a multistoreyed building. The temple residents had to then depend almost entirely on the waters of the victoria lake (situated opposite to the temple) for their daily activities. There was a separate room made for Srila Prabhupada’s stay over here where he used to regularly meet his guests and continue with this translation works.Several important decisions that subsequently shaped the future of ISKCON has been made over here at the Albert Road temple. While staying here at the Albert Road, Srila Prabhupada instructed his disciples to purchase the land for the Iskcon Mayapur Project (refer – ‘Sri Mayapur Chandrodaya Temple – ISKCON, Mayapur , Navadvipa’). The decision to start the life membership program was also taken here at the Albert Road. The temple has blossomed since then, and conducts the biggest Rathayatra festival in India ,second only to Puri. 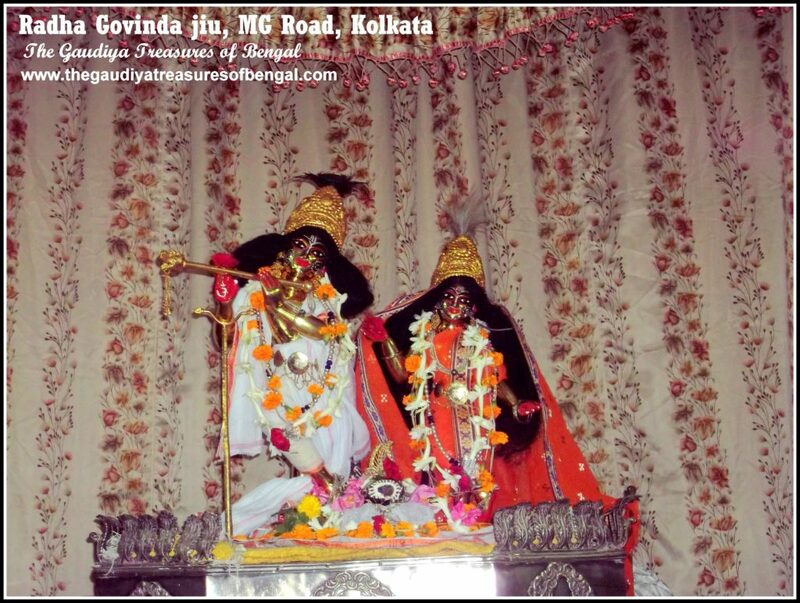 The mesmerizing deities of Sri Gaura-Radha Govinda dev jiu, and Jagannatha Baladeva Subhadra Maharani are the worshipable deities of our Srila Prabhupada. How to Reach: One can board a metro and get down at the Rabindra Sadan Metro station. One can walk the rest of the way to the 3C Albert Road temple, which is situated just opposite to the Birla High school (Minto Park). 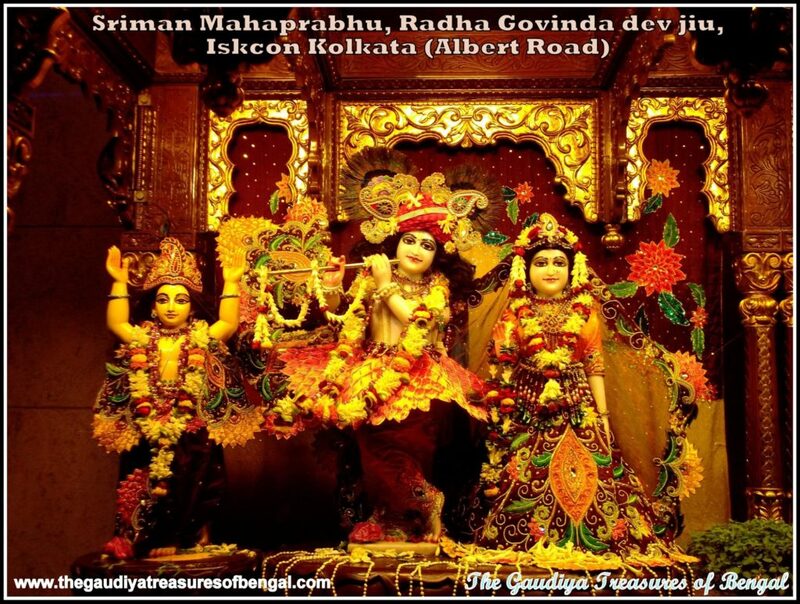 ‘The Gaudiya Treasures of Bengal’ has been striving to seek shelter of great personalities like Srila Prabhupada ,throughout its spiritual journey. It is only with this objective of receiving their mercy and sharing it with others, that we have set out from our homes, trying to reveal to the world the mood and esoteric pastimes of these great men.The life and teachings, of these stalwarts inspire us to imbibe the same values and principles in our own lives and we pray that they mercifully bless us, so that we may forever contemplate upon their blissful pastimes. We worship the lotus feet of Srila Prabhupada and our spiritual master ,whose causeless mercy have empowered us ineligible fools ,to gain entrance and take up service in this transcendental abode of Kolkata. We seek shelter of this holy land, and pray that its glories remain forever imprinted in our heart.‘The Gaudiya Treasures of Bengal’ offers millions of obeisances and humbly prays unto A.C Bhaktivedanta Swami Prabhupada that we advance in our Krishna consciousness, develop attachment unto the lotus feet of Lord Gauranga and are able to serve Sri Guru & Vaishnavas, by our honest and sincere efforts. We seek his blessings and compassion , in successfully rendering this humble service of reciting the pastimes and revealing the pastime places of the Supreme Lord and His beloved associates.We shall consider ourselves greatly fortunate and our existence meaningful if Lord Gaurahari , Srila Prabhupada and our dear spiritual master are kindly pleased with our endeavours. Accommodation – One can choose to stay at any of the hotels (there are many) in Kolkata. One can also opt to stay in the guest house of Iskcon Kolkata (3c Albert Road, Near Minto Park).